Mini-Guide to Air Compressor Safety – What (Not) to Do? As you may have gathered by now air compressors function by squeezing as much air into an enclosed space as possible so pressure is increased. Compressed air can be extremely powerful, which is something power tool manufacturers are incredibly mindful of. As useful as compressed air is, when not handled properly it can become extremely dangerous. In order to minimize the risk of anything going wrong you need to familiarize yourself with the way air compressors function as well as which safety measures to implement. After all, it’s always better to be safe than sorry! Below are some of my safety tips on how you should operate and maintain your air compressor. Make sure the compressor is functioning properly before you decide to actually use it. Check the oil level to see if it’s well-lubricated. 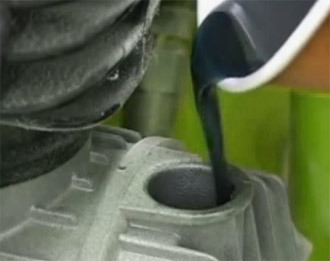 If you need to add oil, avoid overfilling or letting oil spill over the surface of the compressor. Powering the compressor up without oil in it will most likely ruin the unit, and you will have an expensive repair job on your hands or worse still, you’ll have to replace it! You should also check the air filter to make sure it isn’t clogged or dirty. If needed, remove and wash it (if it’s washable). Otherwise you should throw out the old filter and get a new one. Since the compressor has moving parts make sure there is no possibility of them coming into contact with the person operating the unit. Belt-drive compressors can be extremely dangerous because of that, so you should always get a model that has some sort of safety cover or shroud. Power tools are capable of generating static electricity which can be incredibly dangerous if you are using a compressor inside an area where there might be flammable or explosive fumes present. To protect yourself, make sure the air compressor is grounded before starting it up. Using the compressor with a long extension cord is not recommended because it can lead to a drop in voltage and this can harm the compressor. If you are using a gas-powered compressor (and as I have pointed out before in many areas on my website), you should never use it indoors since it produces fumes which are toxic. With both gas and diesel compressors, you need to open the start valve before powering the motor up. After the compressor is up and running you should close the valve. In case the compressor runs out of fuel wait for a few minutes, and let the unit cool down before refilling the gas tank to minimize the chance of fire or explosion. Make sure the discharge pressure of the compressor does not exceed the pressure rating of the power tool attached to it. The value should always be equal to, or lower than the value of the discharge pressure on the compressor. Keep an eye on the pressure gauges of the tank, and make sure they are working correctly. Oh, and the maximum pressure the tank can handle should be clearly labeled. Never disconnect a power tool from the compressor while it’s running unless it has a quick disconnect fitting. Always shut the compressor down first. If it’s an electric air compressor, disconnect it from the power outlet as well. Bleed the entire system of any air left on the inside. Remove the drain valve on the tank to make sure all moisture is drained, and put it back when you decide to use the compressor again. By following this particular guideline, you will protect the tank from corrosion. All of these safety measures and maintenance tips are basic common sense, but if you’re new to air compressors, I think it’s a “must read”! Always be well-informed about the equipment you use, and be aware of the risks when operating high-powered air tools and compressors. If you manage to do all of that, you will be 100% safe at all times. Good luck and stay safe!